Mark was born and raised in Manchester, New Hampshire. Mark graduated from Central High School in Manchester, New Hampshire. He then graduated from the University of New Hampshire, Durham, New Hampshire in 1987. He then worked for two years at Wadleigh, Starr, Peters, Dunn and Chiesa, a local law firm, before attending law school. Mark graduated from Franklin Pierce Law Center in Concord, New Hampshire in 1993. Prior to graduating from law school, Mark worked as a law clerk for Wadleigh, Starr, Peters, Dunn and Chiesa and at Cullity, Kelley and McDowell. He also worked as a law clerk for the Hillsborough County Attorney’s Office and as a volunteer intern at the New Hampshire Public Defender’s Office. 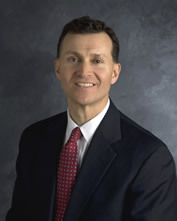 After graduating from law school, Mark was hired by Cullity, Kelley and McDowell in Manchester, New Hampshire. Cullity, Kelley and McDowell subsequently became McDowell & Osburn, P.A. Mark has been involved with all aspects of litigation but his focus over the past several years has been the area of civil litigation, including numerous jury trials. Mark’s experience includes workers’ compensation claims to include litigation at the Department of Labor and at the Compensation Appeals Board. Mark represents individuals for their claims and disputes relative to bodily injury claims, workers’ compensation claims, insurance coverage disputes, and social security disability claims. Mark’s experience in bodily injury claims includes motor vehicle accidents, general tort claims, product’s liability claims and medical malpractice claims. Mark’s experience includes representing numerous claimants and plaintiffs at the New Hampshire Supreme Court. Mark’s appellate work at the New Hampshire Supreme Court includes the following cases: Coco v. Jaskunas, 159 N.H. ___, ___, 986 A.2d 531 (December 16, 2009): Stankiewicz v. City of Manchester, 939A.2d 873 (2007); In Re Malouin, 155 N.H. 545 (2007); Porter v. Coco, 154 N.H. 353 (2006); In Re Appeal of Lorette, 154 N.H. 271 (2006); Kenison v. Dubois, 152 N.H. 448 (2005); Swain v. Employers Mut. Cas. Co., 150 N.H. 574 (2004); Allen v. Dover Co-Recreational Softball League, 148 N.H. 407 (2002); Gorman v. National Grange Mut. Ins. Co., 144 N.H. 157 (1999); Appeal of Barry, 142 N.H. 284 (1997); Lorette v. Peter-Sam Investment Properties, 142 N.H. 208 (1997); Bruzga v. P.M.R. Architects, P.C., 141 N.H. 756 (1997); Walsh v. Amica Mut. Ins. Co., 141 N.H. 374 (1996); Mason v. Smith, 140 N.H. 696 (1996); Lorette v. Peter-Sam Investment Properties, 140 N.H. 208 (1995); and Brady v. Mullen, 139 N.H. 67 (1994). Mark is a partner at McDowell & Osburn, P.A.